The largest number of fatal motorcycle accidents by far comes from multi-vehicle crashes (though they comprise only 56 percent of all crashes, they cause over 85 percent of fatalities). This is due to the devastating effect a large vehicle can have on a relatively unprotected motorcyclist – especially one who is not wearing proper protective gear or a helmet. In fact, in 98 percent of all fatalities occurring during car-on-motorcycle crashes, the motorcyclist is the person to die. Passenger vehicles are less likely to strike motorcyclists than the other way around, but that doesn’t stop vehicles from failing to observe proper right-of-way laws or share the right of way with motorcycles and other alternative vehicles. Motorcycles can crash into passenger vehicles due to defective motorcycle parts, improper training, speeding, fatigue, inclement weather, or the use of drugs and alcohol. These crashes are more likely to occur on weekends and on largely urban roads. According to the National Highway Traffic Safety Administration (NTHSA), there were approximately 74 fatalities per 100,000 registered vehicles – and that number doesn’t even take the 88,000 motorcycle accident injuries that occur each year into account. Given that there are around 6.2 million motorcyclists in the United States, it is clear that this number is much too high. Unfortunately, as long as there are negligent drivers on the road, safety and protective gear can only go so far. According to "Motorcycle Accident Cause Factors and Identification of Countermeasures" (the Hurt Report), motorcycle accidents often result in severe injury and can be deadly. The Hurt Report examined nearly 4,500 crashes occurring in the Los Angeles area and was sponsored in part by the NHTSA in 1981. 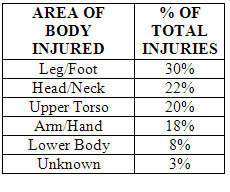 Injuries to the accident victims’ chest and head were the most deadly. The use of a safety helmet is the single-most critical factor in preventing or reducing head injuries. The use of the full facial coverage helmet increases protection, and significantly reduces face injuries. Safety helmet use caused no attenuation of critical traffic sounds, no limitation of pre-crash visual field, and no fatigue or loss of attention; no element of accident causation was related to helmet use. There is no liability for neck injury by wearing a safety helmet; riders wearing helmets had less neck injuries than riders without helmets. Approximately 50% of the motorcycle riders in traffic accidents were using safety helmets; but, only 40% of the motorcycle riders were wearing helmets at the time of the crash. Seventy-three percent of the accident-involved motorcycle riders used no eye protection, and it is likely that the wind on the unprotected eyes contributed in impairment of vision, which delayed hazard detection. The use of heavy riding boots, a motorcycle jacket, riding gloves, etc., are effective in preventing or reducing abrasions and lacerations. Such injuries occur frequently, but are rarely severe. The severity of the injury increases with the speed involved, alcohol use, and the size of the motorcycle. Approximately half of the fatal accidents involved alcohol. More than half of the accidents involved motorcycle riders with less than 5 months experience on the motorcycle. Motorcycle riders with previous recent traffic citations and accidents are over represented in the accident data. Motorcycle riders between the ages of 16 and 24 are significantly over represented in accidents; motorcycle riders between the ages of 30 and 50 are significantly underrepresented. The majority of the accident-involved motorcycle riders are male (96%). Nearly 75% of the crashes involved motorcycles in a collision with another vehicle, which was mostly a passenger car. The failure of motorists to detect and recognize motorcycles in traffic was the predominating cause of motorcycle-car accidents. The driver of the other vehicle did not see the motorcycle before the collision, or did not see the motorcycle until too late to avoid the collision. The impact scenario most frequently occurring is the motorcycle proceeding straight ahead and the car making a left turn in front of the motorcycle. In accidents involving multiple vehicles, the driver of the other vehicle violated the motorcycle’s right of way and caused the crash in 2/3 of the cases. Intersections are the most likely place for motorcycle crashes with other vehicles. Conspicuity of the motorcycle is a critical factor in multiple vehicle accidents, and accident involvement is significantly reduced by the use of motorcycle headlamps (on in daylight) and the wearing of high visibility yellow, orange or bright red jackets. Motorcycle riders in many accidents showed significant difficulty avoiding collisions. Most riders would over- brake causing the rear wheel to skid. And, they would under brake with the front wheel, preventing proper deceleration and avoiding the collision. As such, they were unable to counter steer and swerve to avoid the collision. About a quarter of the crashes involved a single motorcycle that either struck a fixed object and/or ran-off the road. The likelihood of injury is extremely high is these motorcycle accidents-98% of the multiple vehicle collisions and 96% of the single vehicle accidents resulted in some kind of injury to the motorcycle rider; 45% resulted in more than a minor injury. Vehicle failure and roadway defects accounted for less than 3% of motorcycle crashes and weather conditions were not a factor in 98% of the cases. The typical lines-of-sight to the traffic hazard portray no contribution of the limits of peripheral vision; more than 75% of all accident hazards are within 45 degrees of either side or straight ahead. The average pre-crash speed was 29.8 miles per hour, and the average crash speed was 21.5 mph. Lack of attention to driving is a common factor for the motorcyclist in an accident. Voluntary helmet use rates by motorcyclists in states that do not have helmet laws are about 45%-55%. With mandatory use laws, more than 90% of riders in that state wear helmets. According to a NHTSA Study that examined the effects of helmet-law repeal on motorcycle fatalities over a 10 year period across several states, a 10.4% to 33.3% increase in the fatality rate per accident occurred. Severe brain injury was found to be 600% higher for unhelmeted riders based on an Oregon Study. 55% of all fatal motorcycle crashes occurring in the United States in 1998 involved multiple vehicle crashes and 45% occurred in single-vehicle crashes. Five crash types account for 86% of fatal motorcycle crashes: motorcycle runs-off-road 41%, motorcycle or other vehicle runs traffic control 18%, head-on collision 11%, car turns in front of motorcycle 8% and motorcycle goes down in roadway 7%. Forty-five percent of deaths in single-vehicle motorcycle crashes in 1998 included drivers with a blood alcohol concentration at or above 0.10%. 9 out of 10 motorcycle deaths in 1998 were males. Seventy-seven percent of the females who died in a motorcycle crash were passengers and 98% of males who died were drivers. At Tenn And Tenn, P.A., we understand the stakes in motorcycle accident lawsuits – and we understand how your livelihood and well-being could be affected by a severe motorcycle injury. We welcome new personal injury lawsuits seeking compensation for motorcycle accident related injuries and fatalities. Don’t let yourself become a statistic – fight back against negligent drivers with our proven results and resourceful staff. Contact an experienced New Hampshire motorcycle crash lawyer at Tenn And Tenn, P.A. immediately to help protect your rights. Our toll-free hotline is 1.888.511.1010. All consultations are free of charge and completely confidential.